You Me At Six are finally back in Manchester at the O2 Victoria Warehouse to tour their latest album VI and also to celebrate the anniversary of their debut Take Off Your Colours as it turns 10 years old. This hotly anticipated show also featured the incredible talents of The Exerts and Marmozets which really set the bar high for the main event. Marmozets kicked off the show with their high energy set that really built up the crowd and encouraged a riotous and lively atmosphere which remained prominent right until the curfew. Becca Macintyre was on top form delivering some stunningly impressive vocals across the entire set. Particular highlights included ‘Habits’ and ‘Major System Error’ where the extent of her vocal range was depicted strongly. After months of festivals and hard work, it is clear to see that the band is really making progress and hopefully with the release of new music it shouldn’t be long before we see another tour from this talented band. As the lights went down, the pulsating sounds of ‘Fast forward’ filled the clammy warehouse space and the gig kicked off with an immediate jump start of energy. 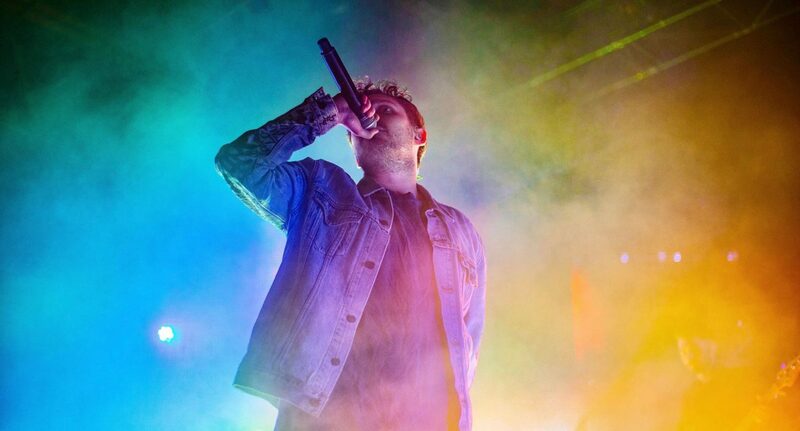 Lead singer Josh Franceschi whipped the crowd up into a glorious frenzy as he led them into the depths of a gig that explored a colourful explosion of many youthful tracks, perfectly mixed in with the band’s more matured discography. There is no denying that the new album features some creative ideas and spirals into a newer brand of indie pop but the band’s decision to juxtapose such light-hearted notes with the heavier greats found on 2011’s Sinners Never Sleep, really made the classics stand out. Hearing the band’s hit, ‘Reckless’ still very much alive and adored by their cult fanbase certainly appeared bizarre beside newer tracks such as ‘I O U’. Although it is quite innovative in sound, it was completely at odds with the majority of their pop-punk vibe, seeming to lack the anthemic power of previous tracks. Overall, the ultimate high point of the gig was the segment of the show dedicated to Take Off Your Colours which was a huge hit across fans, both young and old. ‘Save it for the bedroom’ really lingered as being an inspiration of wild atmosphere for the crowd as they immediately recognised the nostalgic hit and plunged into an enthusiastic chorus. The event really stood testament to the dedication of You Me At Six fans that have firmly remained with the band through their ups and downs, across the boundaries of creativity into the newer realms of indie pop. The transitions between albums are not by any means perfect but nevertheless, fans were certainly impressed.